Camping encompasses so many fun family activities. Bring your family closer with some activities that everybody can enjoy! Check out these 10 card games to play while camping! This post contains affiliate ad links for the games. Camping encompasses so many fun family activities. Not only are there endless hours spent exploring all the beauty of nature, but make certain to not forget about the time that you can spend playing fun card games as well while sitting around the campfire. That’s the beauty of camping! There are no plans, nothing that has to be done and a ton of time to just explore and be together. One of the best and most relaxing things to do when camping? Play cards. Think about sitting around the campfire at the end of the day, and just relaxing together with a nice game of cards. Sounds wonderful, right? If you’re looking for a few fun and awesome campfire card games, look no further than these great suggestions. Phase 10. If you’ve never given this card game a try, you’re missing out. Make certain you have some time on your hands to be able to finish though, as it can take a bit of time. There are 10 phases to work through, each one more challenging than the one prior. Roast up some hotdogs and marshmallows and be prepared to have a night full of fun with this addictive card game. Pictionary Card Game. Looking for a card game where you have to act out the clues? This game is sure to keep everyone laughing and engaged for the entire game! Sleeping Queens. If you are looking for a family-friendly game that everyone in your entire family can play, look no further than Sleeping Queens. Not only was this game created by a kid, its super fun and addictive as well! The Oregon Trail Card Game. Who doesn’t remember this classic game? Bring it with you on your next camping adventure and work together as a team to move on down the trail. Uno Emoji. Nothing like bringing a smile to your face than dealing a winning hand of Uno Emoji on your next camping trip. Everyone loves Uno! Old Maid. The same classic card game that we all grew up playing and loving. It’s time to pass it down to your children and family to continue playing on each of your camping traditions. Smack It! What better place to play a highly loud and fun game than out in the great outdoors when camping? This game combines the two classic games of War and Slap Jack and is sure to create quite the fun chaos for all who play. Five Crowns. Simple to learn, hard to stop playing! This rummy-style card game is certain to be a hit for hours upon hours of family fun. Rook. Looking for a fast-paced card game full of friendly competition? This is the game for you. Beware…the rook card will keep you on your toes! Deer in the Headlights. What other card game out there combines dice and cards? With this quick-moving card game, you’ll be certain to learn on the fly as you go! Simple to play, but hard to quit! Think about your next camping trip and start planning now about what card games that you plan on packing and taking. The best part about playing card games on your camping adventures? You have all the time in the world to play them! You can wake up early in the day and start a game, take a midday break and play a game or two and snuggle up near the campfire at night and have a few rounds as well. And if no one else wants to play with you? Bring a deck of cards and play solitaire with yourself. No matter what, there are always options to be able to play a card game when camping. While the suggestions above are great, don’t forget the power of just a good ol’ deck of cards as well. Rummy and War are two great games that can be played by anyone at any point in time. Remember, while playing card games is fun the true fun lies in being able to have that bonding time with your family. Take charge of those bonding opportunities and pack up a few fun card games for everyone to enjoy. You’ll love how much fun everyone has together when given the opportunity to take a step away from the chaos of life and relax on your next camping trip. Let’s talk! What is your favorite card game to play? Phase 10 is one of our favorite camping games to play! We love camping. Definitely will check out some of these other card games! When we use to go camping 3 or 4 times each summer one of the many things we did was play cards rather it be late at night or during a rain storm. I have heard of or played a few of those games but the ones I haven’t and would like to try are Sleeping Queens and Deer in the Headlights. There’s nothing quite like leaving the city,routine and internet and taking a camping trip away from it all huh? 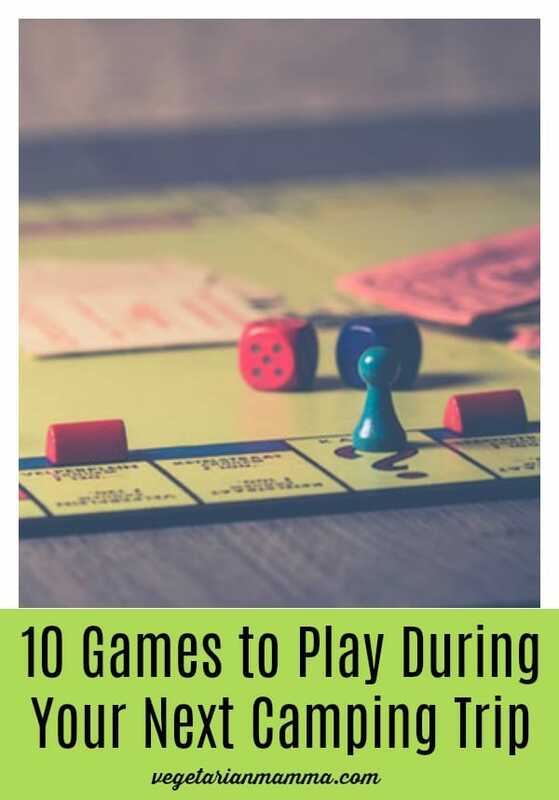 🙂 Love this list of card games – we’ll play some on our next trip! Definitely going to play Smack It when I go camping this weekend. Thanks for the idea, I can’t wait to see how it goes! I used to absolutely love playing cards with my mom and am keen to get the boys doing the same with me. Thank you for this list as a reminder of what I haven’t taught them and introducing me to some new ones. This sounds so much fun! My kids will surely enjoy these games! Thanks for sharing!